The International Search Summit took place in London on Thursday at the British Library. I was due to write a full wrap up but there was so much great content, that many sessions deserve a post of their own. This particular session was without a doubt one of the stand outs not only because it was presented by the awesome Marty Weintraub but the information presented came from an aimClear study of 7 Search Engines, 45 social media platforms and various countries for actionable SEO insights that has not even been published yet. Most SEO professionals know that you can use special Google search operators to show listings that indicate how your site is indexed by Google. (link: related: site: cache:). The search operater site: is particularly useful as it shows pages that have been indexed on your site. Until this session I didn’t know or even think about the fact that used creatively, this operator can find the right conversation and help you put together a killer social strategy that influences not just what you optimise for, but the kinds of pages you optimise in a given market. Just to recap, the site: search operator when used with a domain eg ‘site:yourwebsite.com‘, will return a list of all pages indexed on a particular website. 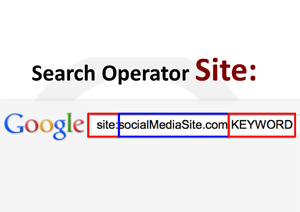 If you expand the operator to include ‘site:yourwebsite.com keyword’ the operator will find all pages listed on a particular website that have that keyword focus. Some SEO’s believe that the pages listed in a :site search are a representation of the algorithmic regard that Google has – not necessarily for that specific listing – but for sections of the site that show up. 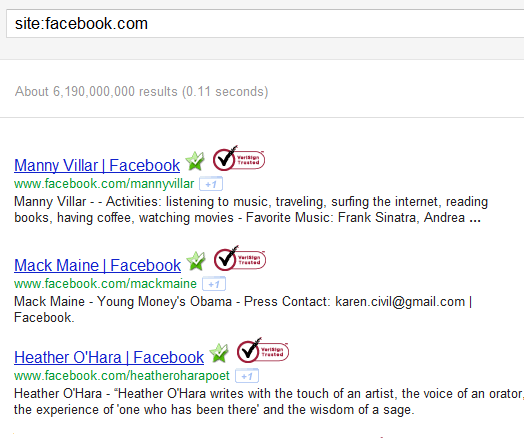 Q: Is using site:yourwebsite.com keyword an indication lf the most important ranking URL’s in Google for that website? A: No, but it is an indication of the types of content that Google and other search engines have an interest in ranking. Why should the Social Marketer Care? All SEO and Social Media professionals like to see their activities show up in the search engines, so by knowing what types of resources have more algorithmic respect, you can revise your social media in that channel. Every search engine has a different sort of respect for different parts of different social media communities, so testing and having an understanding can be of benefit to the SEO social media marketer. 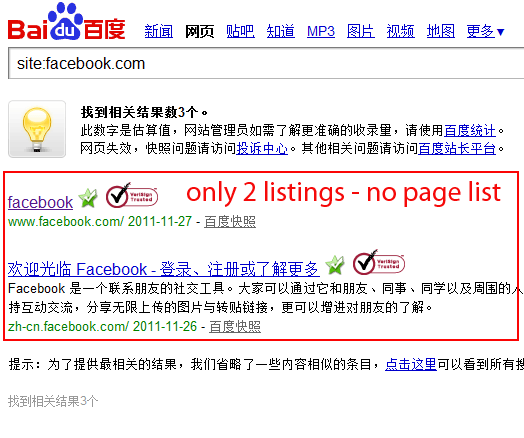 If you run this search in the Chinese website Baidu.com – you will find that Facebook is listed, but site pages do not show as they do in Google. This means that if Facebook pages are not important to Baidu.com, and you are optimising social content for Chinese markets, there is little point focussing on Facebook pages for optimum results (at this time). Tip: Chrome translation is your friend – it may not give you precise translations but if you are searching in multiple languages, you can at least get an idea of what is being talked about. 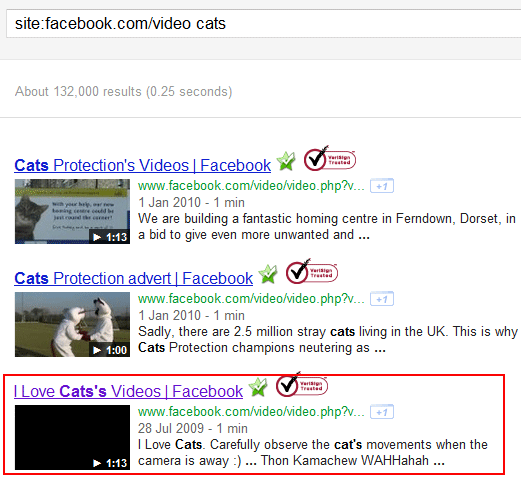 So far this kind of search has been concerned with ‘top level’ categories within sites. It is possible to use the site: operator to go deeper within any URL. If you want to see more London related content within flickr simply search for the ‘london’ tags site:flickr.com/phptps/tags/london. Not only can you find out what sorts of content in social media sites index well in various search engines by the site itself, but you can note how these sites organise their content by URL structure. Once you have the structure, you can run the site: search operator within those site structures. 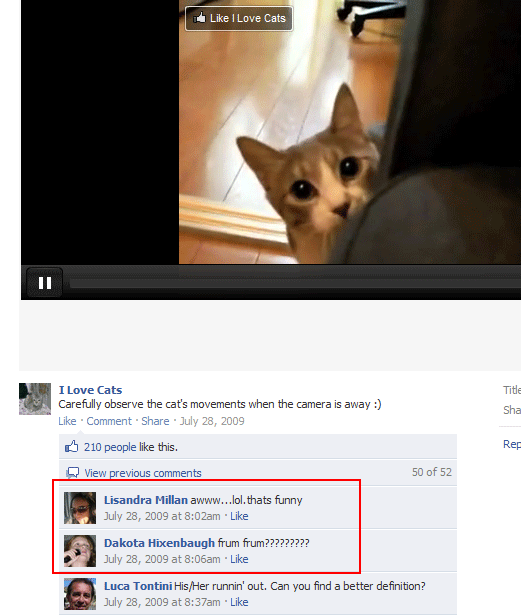 To find out who is interested in cat videos search for site:facebook.com/videos cats . Follow any link through, and you find the conversations that people have been having. Win friends and influence people RIGHT NOW! If you want to figure out who’s talking about what and when in any social media site where the footprint includes a date stamp – add the date stamp to your site: operator search to bring up lists of leads that can be contacted in real time and engaged in conversations that they are having right now. The example Marty used site:facebook.com/nytimes wine november 2011 brings up reviews, conversations, polls and many ways to engage on many platforms. Finding conversations is the cornerstone of any data driven community manager so if we know that the search engines seem to have an algorithmic regard for particular areas of social sites, then that’s where we want to be looking and where we want to be optimising social content. You can download the slide presentations ‘The International Social Media Marketers SEO Field Guide – by Marty Weintraub for the next few days ONLY by visiting the aimClear Facebook Page – once you like the page, you can download the ISS.ppt file. I learned something new here today, Jackie. Thank you for sharing! Hey thanks for the feedback Kevin – glad you enjoyed! – Thanks also to Marty @aimclear for the insider knowledge! 🙂 I’d be really interested to know if this brings up a new world of content for you so let us know how you get on!